Some of the big brands around the nation, and the world, are still failing to grasp the basics of using social media for connecting with customers. That’s why I started a kind of regular feature about social media fails. 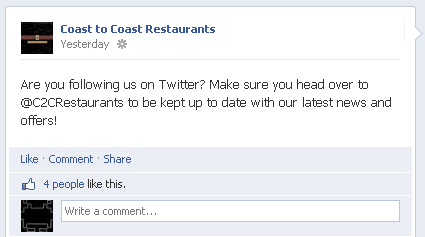 This edition’s fail comes from a restaurant chain called Coast to Coast. They currently run two main social media channels, the Coast to Coast Facebook Page and the Coast to Coast Twitter Account. At the time of writing their Facebook page has 2,137 fans and their Twitter account 8,665 followers (although they’re following 9,351 so currently in negative equity when it comes to those all important made up ROI stats). The following post I’m about to show you came from their Facebook page, and is a quick guide on how not to cross sell your Facebook fans to Twitter. So going from that, you’re saying you’re not going to keep me up to date on the Facebook page? What are you using it for, old news? The lesson to learn here – yes it’s a good idea to ensure your social media channels get unique content and posts suitable for that channel’s audience, but when you’re cross selling them try and make sure you don’t make the other sound redundant and out of date. When you’re cross selling different channels – try not to make one sound completely redundant. Oh and Coast to Coast, one more thing – there’s this wonderful invention on the internet called the hyperlink. Makes it super easy for people to get to content you’re talking about. Maybe use one on a post next time so instead of giving a dead Twitter handle on Facebook (see my post Top 5 Reasons Linking Twitter to Facebook is Wrong for more) you could provide them an actual direct link to your profile so they can follow you super easy! 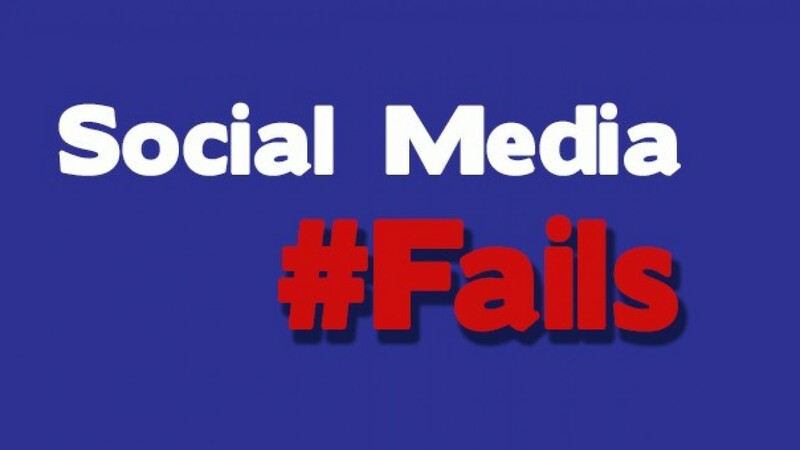 If you’ve seen any social media fails from big brands recently, get in touch and let me know or use the comment box below.